Caliper Digital XL 150mm LH! Specially made for the lefthanded! 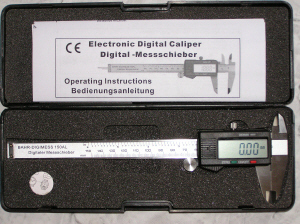 Digital caliper with 150mm range. Hardened stainless steel, smooth action, excellent quality. Large readout with 0.01mm resolution. Switchable between metric sizes and inches. Reduces measurement errors. Storage case included.